The game started out crazy with Montreal tallying 29 seconds into the contest despite the fact that Mathieu Darche knocked Marc-Andre Fleury to the ice behind the cage. Pittsburgh answered 33 seconds later when a rebound went off the body of Pascal Dupuis and ended up over the goal line. Montreal was the better team from that point as the game settled down, scoring twice each in the second and third periods to open up a couple of multiple-goal leads from which the Penguins could never recover. Like they have all season, Pittsburgh battled all the way until the end in spite of being down by three goals as Evgeni Malkin notched a shorthanded goal with 3:16 remaining, and Montreal’s Jaroslav Halak robbed Ruslan Fedotenko with 2:32 to play, a save which prevented the Penguins from closing within a goal. 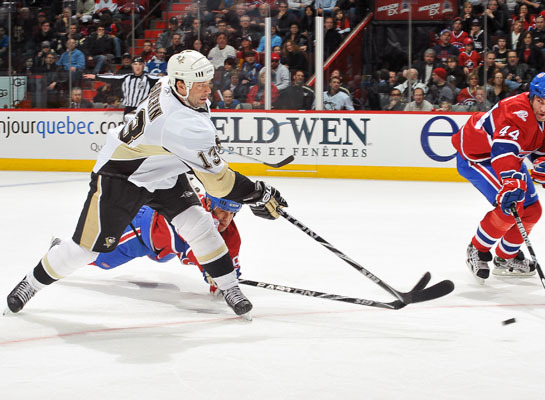 Montreal outshot the Penguins, 32-21. MONTREAL (AP) – Brian Gionta had two goals and an assist and Jaroslav Halak made 18 saves to win his third straight start, leading the Montreal Canadiens to a 5-3 victory over the Pittsburgh Penguins on Saturday. Pittsburgh might not have been able to make the comeback this game, but it wasn’t for a lack of persistence. Twice they quickly answered Montreal goals – a Pascal Dupuis tally 33 seconds after the Canadiens scored in the first period, and a Bill Guerin goal 3:36 after Montreal had taken a two-goal lead in the second period. Montreal might have scored only once in seven tries with the man-advantage, but that one goal, off the stick of Scott Gomez in the second period, gave Montreal a two-goal lead the Penguins could never recover from. Pascal Dupuis always plays well in front of his family and friends in Montreal, and today was no exception. Skating on a line with Jordan Staal and Evgeni Malkin, Dupuis allowed the Penguins to answer a Tomas Plekanec goal 29 seconds in the contest by crashing the net and having a Staal rebound go off his body into the cage 33 seconds later. Besides scoring a goal, Dupuis finished with three shots on goal, blocked a shot and had a plus-one rating. Over his past 12 games, Dupuis has picked up 10 points (4G-6A). Montreal struck first when Mathieu Darche collided with Marc-Andre Fleury behind the Penguins net, leaving an open cage for Tomas Plekanec to throw the puck in from the left-wing boards. Montreal 1, Pittsburgh 0. Pittsburgh answered that score 33 seconds later when Pascal Dupuis crashed the cage and had Jordan Staal’s rebound go off his body and over the goal line to knot the game. Pittsburgh 1, Montreal 1. The Canadiens took the lead for good when Brian Gionta took a breakout pass from Roman Hamrlik and moved in all alone against Fleury. Gionta went to his backhand to float a shot over the Penguins netminder as he dove through the air. Montreal 2, Pittsburgh 1. Montreal increased their lead on a power play as players from both teams converged around the Penguins crease until Scott Gomez slammed the biscuit into the cage from the right of the crease. Montreal 3, Pittsburgh 1. The Penguins cut into the Canadiens lead when Bill Guerin took a pass from Sidney Crosby in the right circle and fired a wrist shot which got under Halak despite the fact that the Montreal netminder got a piece of the rubber on the way through. Montreal 3, Pittsburgh 2. Darche restored a two-goal advantage for the Canadiens by beating Fleury to the short side with a slap shot off the rush from the top of the near circle 12:45 into the final period. Montreal 4, Pittsburgh 2. Gionta all but put the Penguins away a little over three minutes later when he scored from just inside the paint on his knees to make it a three-goal advantage for the home team. Montreal 5, Pittsburgh 2. Evgeni Malkin capped the scoring when he sprinted out of the penalty box and took a lead pass from Jay McKee and beat Halak under the glove for the shorthanded goal. Montreal 5, Pittsburgh 3. The Penguins once again played without injured forwards Maxime Talbot, Eric Godard and Chris Kunitz against the Canadiens, forcing the team to once again dip into the farm system in Wilkes-Barre/Scranton. Center Mark Letestu, who scored his first NHL goal on Monday against the Sabres, was joined by winger Tim Wallace, making his first appearance in Pittsburgh this season. Wallace finished with three hits in 5:50 minutes of ice time. Head coach Dan Bylsma replaced goaltender Marc-Andre Fleury in favor of Brent Johnson following the Canadiens’ fourth goal at the 12:45 mark of the third period. Johnson stopped three of the four Montreal shots he saw the rest of the way. > Despite the loss the Penguins were able to capture the season series from the Canadiens, 3-1, defeating them twice in Pittsburgh (6-1 on Oct. 28; 3-1 on Nov. 25) and once in Montreal (3-2 on Dec. 10). > Since head coach Dan Bylsma took over on Feb. 15, 2009, the Penguins are 53-25-5 in the regular season and 26-14-3 on the road. > Pittsburgh is back in action on Sunday afternoon when they take on the Washington Capitals at the Verizon Center. The Penguins have a 6-4 record in the second half of back-to-back games this season. > Sidney Crosby’s assist on Bill Guerin’s second period goal was the 300th assist of his NHL career. The assist gave Crosby six points (4G-2A) in four games against the Canadiens this season. Over his past 14 games Crosby has picked up 23 points (13G-10A). > Evgeni Malkin picked up a goal and an assist against the Canadiens to extend his season-high scoring streak to nine games, during which he has 16 points (7G-9A). > Bill Guerin picked up his 17th goal of the season against the Canadiens, third-most on the team. way to lose a match."